This is my Mario Action figure review, where I’m covering loads of my favorite Mario figures. I think you’ll like them a lot too because they are SO COOL! Some are more like statues and others that are true action figures that you can place into a lot of fantastic poses. Make them run, jump, fight each other. It’s so fun! Mario always puts a smile on my face with his joyful nature and I love the figures that remind me of my favorite games. So many great memories of Mario 64 and Super Mario Sunshine. Great fun. Let’s get things going by starting off with some of the most popular Mario toy figures, the Amiibos from Nintendo. Amiibo figures are awesome. There are so many different kinds. Plenty of different Mario Amiibos in particular are out there too! If you want to look at all of them, you can collect all of the Mario Amiibos here! All around I think Amiibos are superb figurines. It’s because they have great craftsmanship and they’re at a great price. Sometimes they can be hard to find. But, I know where to get Amiibos. First, off we’ll start off the Mario action figures collection with the Super Smash Bros. series Mario. This Mario is of course, from one of my favorite video games, Super Smash Bros. We all love Smash Bros, don’t we? In this portrayal of Mario he’s holding a fire ball. There are actually a couple moves from the game that use a fire ball. A fireball attack is one of his signature “smash” moves in the game. It does a lot of damage to his opponents and it can be charged for a more devastating attack. He has a nice action oriented stance, it’s more like an aggressive ready for battle type of stance. I like the effect on the fireball too. This figure is one of the first Amiibos. In conclusion, great figure. The second Amiibo figure I’d like to talk to you about is the one from the Super Mario Series. Wouldn’t you agree, this is the pose we all think of when we hear Mario. Warm, welcoming, and happy! This Mario has a special red base. Actually, all of the super mario brothers Amiibos have a red base. If you’re in the habit of collecting Nintendo characters, I think this is a great figure to start with. There are also the Gold and Silver Marios. These guys can be tough to track down. They’re pretty rare. But I think they are well worth the search. 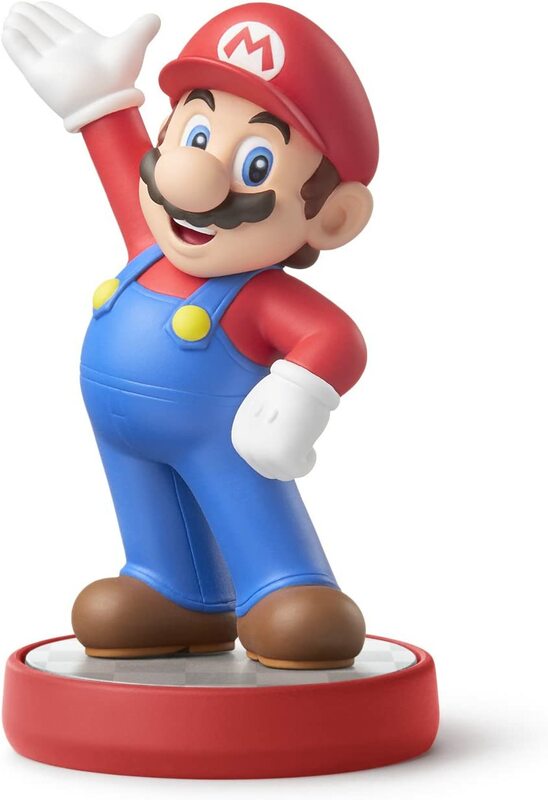 They have the same wonderful pose that encapsulates Mario as this Super Mario Bros Amiibo. You can find the gold and silver Mario here! If you’re feeling sick, you better take a trip to see Dr. Mario. Dr. Mario comes from a game like Tetris but, instead of the usual Tetris pieces, it used pills/vitamin capsules. 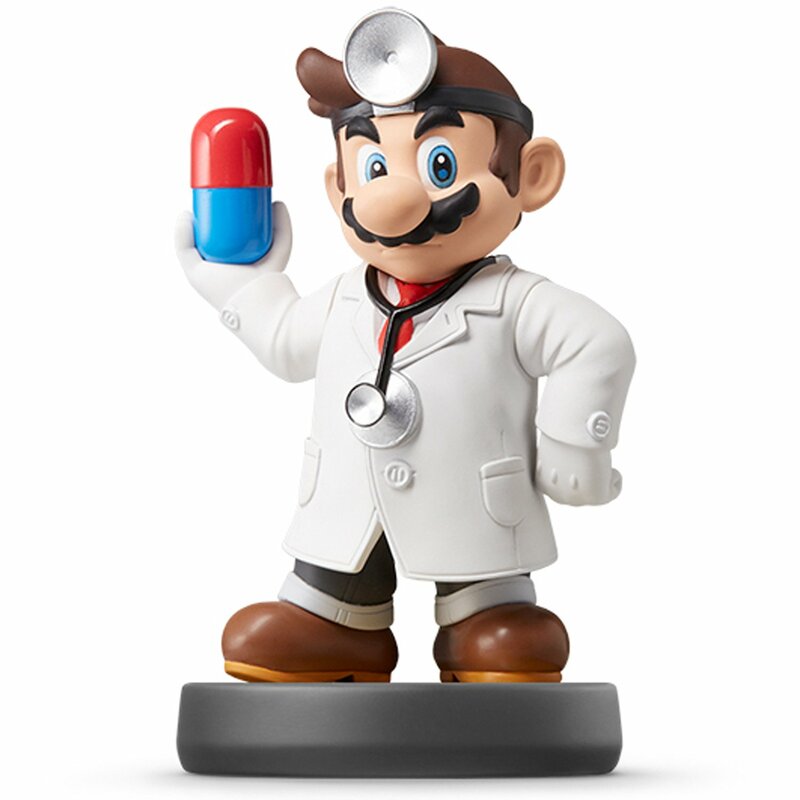 I really like the Dr. Mario figure, it looks very nice. It has a good clean look to it. Dr. Mario also appears in Super Smash Brothers and has a similar move set to Mario but, he uses pills instead of fire balls. I think the Doctor outfit works really well for Mario and the vitamin he’s holding has a cool look to it. We see the original classic Mario all the time so it’s nice to mix things up with a different look for him. Awesome figurine. 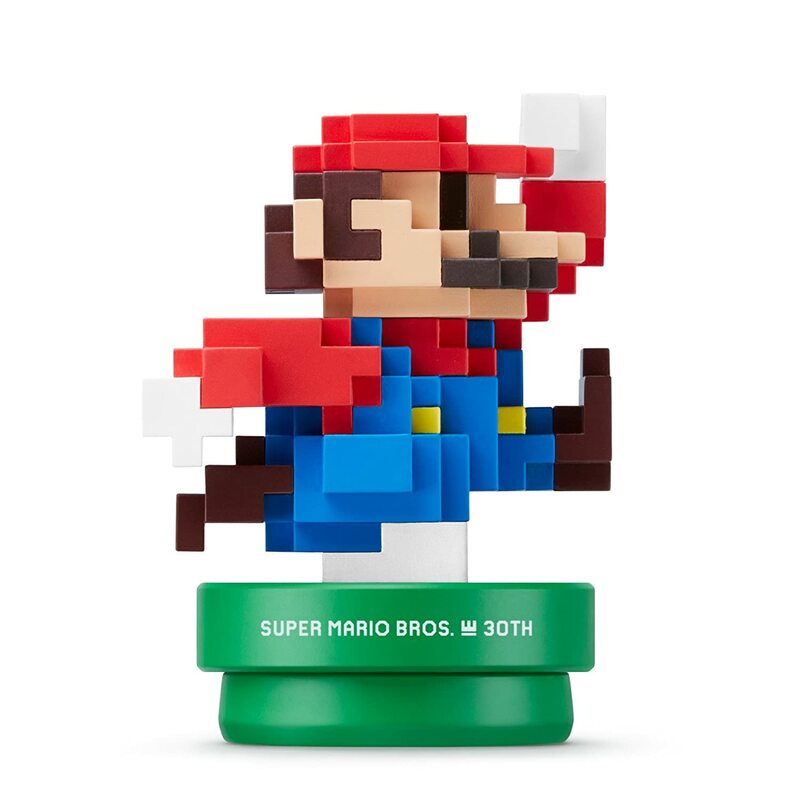 The Final two Mario Amiibos are the 30th Anniversary Classic Mario figures. One is in the classic Mario colors from the NES game and the other is in the more modern colors. They are kind of pixelated just like the old Mario games look which is pretty interesting. They also sit on special warp pipe stands rather than the classic black Amiibo stands. This makes them quite special. In short, all of the Amiibo figures are awesome. There are so many World of Nintendo figures but, we’ll just be covering the Mario ones. I’m excited to show these to you guys! There’s still a lot of great World of Nintendo figures! They are definitely worth checking out if you’ve got the time. World of Nintendo figures are made by Jakks Pacific. They are a great toy manufacturing company. They have many great Mario figures for sale but, we’ll start off with a classic Mario figure first. 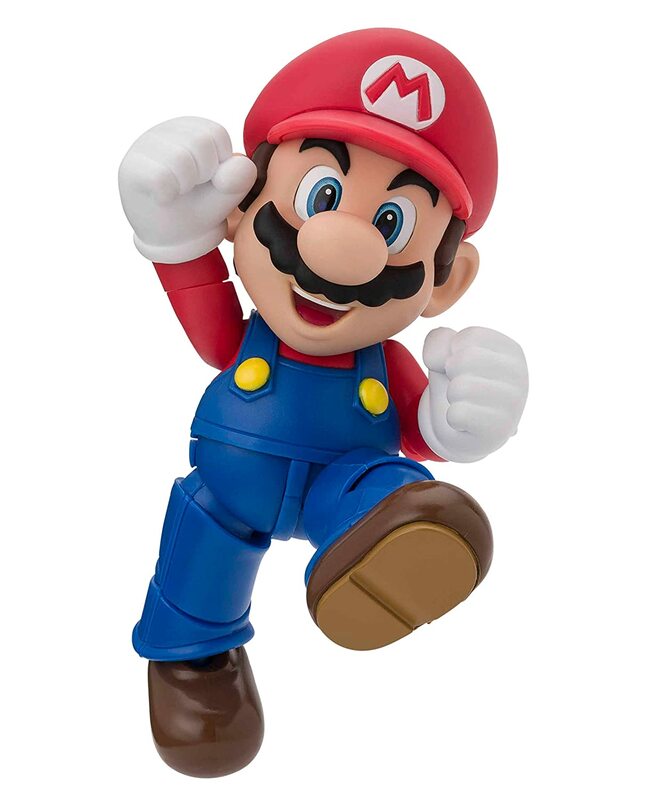 First up, for World of Nintendo we have this four inch Mario figure. You’re gonna love him. Mario has a good number of points of articulation. So he is pretty easy to pose and move around. He has some ball joints at the shoulders. His gloves are twist-able too. In addition, You can move his elbows up and down. He also has a ball joint on the top of his legs with you being able to move his knees up and down. All around he is a wonderful figure for posing. He also comes with a mystery accessory inside a question block. It’s a mushroom, which is pretty cool! In fact, each of these four-inch world of Nintendo figures come with their power up as the mystery item. They also have a fire flower and a gold version of this Mario. The fire flower version is red and white and also comes with a mystery accessory which is a fire flower. The Fire Flower Mario is here! The gold version of this Mario comes with a coin as the accessory. Unfortunately, the accessory on this one does not come in a mystery question block. Check out the Gold Mario figure! I remember playing Super Mario Brothers 3 and always hoping I’d get the Tanooki Suit. It was a rare power up. A strong one too. I think that’s one of the reasons I love this figure. The Tanooki suit is from Super Mario Bros 3 and lets Mario glide as well as turn to stone to become immune to damage. This is a wonderful figure to add to any collection. 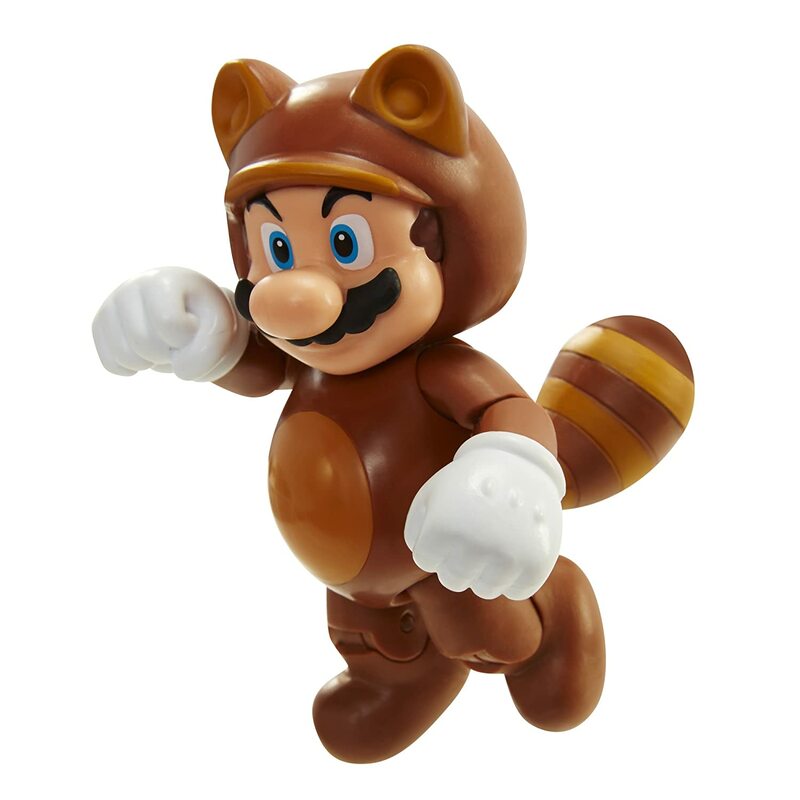 You can’t really find a lot of Tanooki suit Marios around, at least not as many as classic mario. 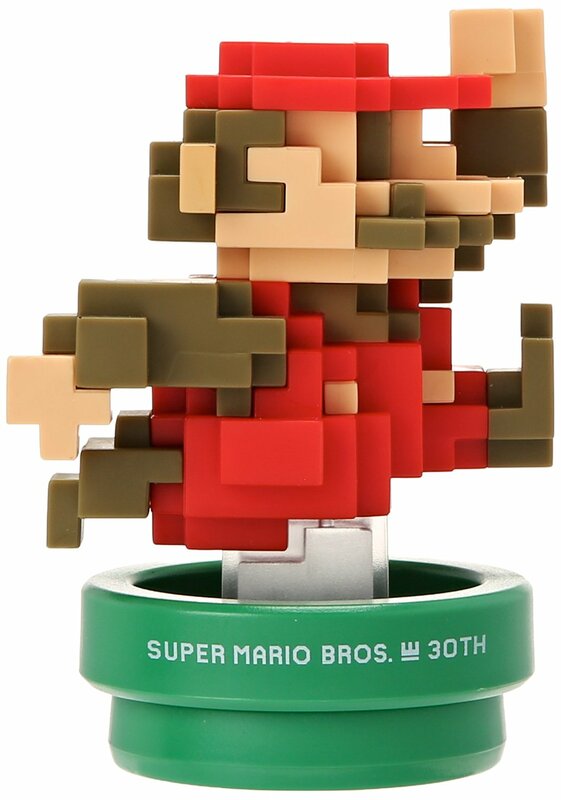 Otherwise, it has the same kinds of joints as the classic Mario figure above. With the added bonus that he can move his tail a little bit. Indeed, it is such a super nice detail! 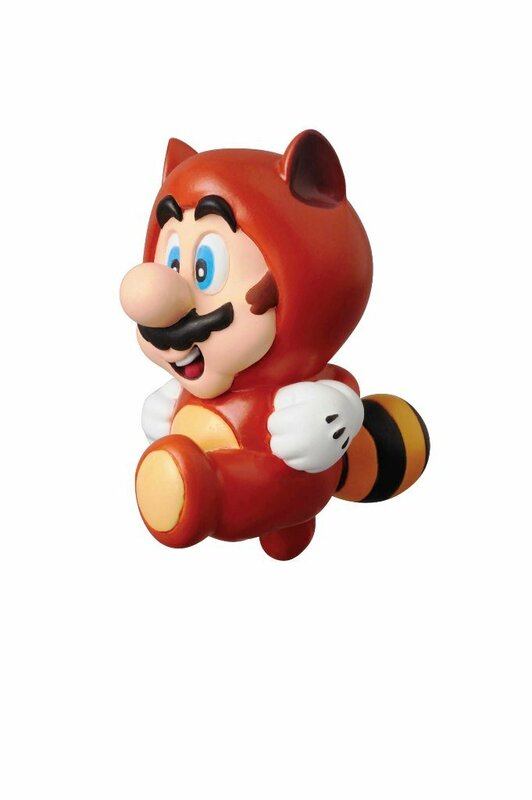 Tanooki suit Mario comes with a power up leaf as the mystery accessory. I think he’s one of my favorites from Jakks Pacific. There are also multi colored Tanooki Suit Marios. 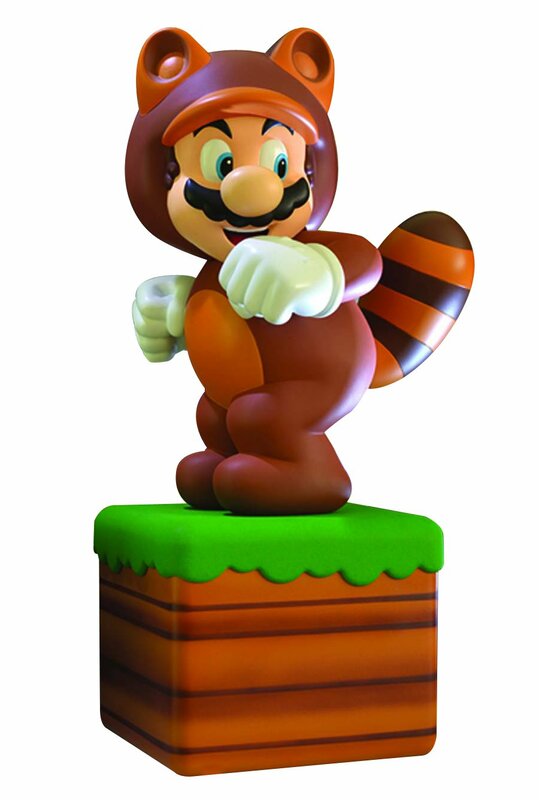 One is a goldish color which is the trophy series Tanooki Mario. The other is a white one. Take a look at all of the Tanooki Suit Marios. Of course, knowing the internet. There has to be a Cat Mario. He’s also part of the four inch series of Marios. Cat Mario is very similar to Tanooki Mario with just a few small differences. 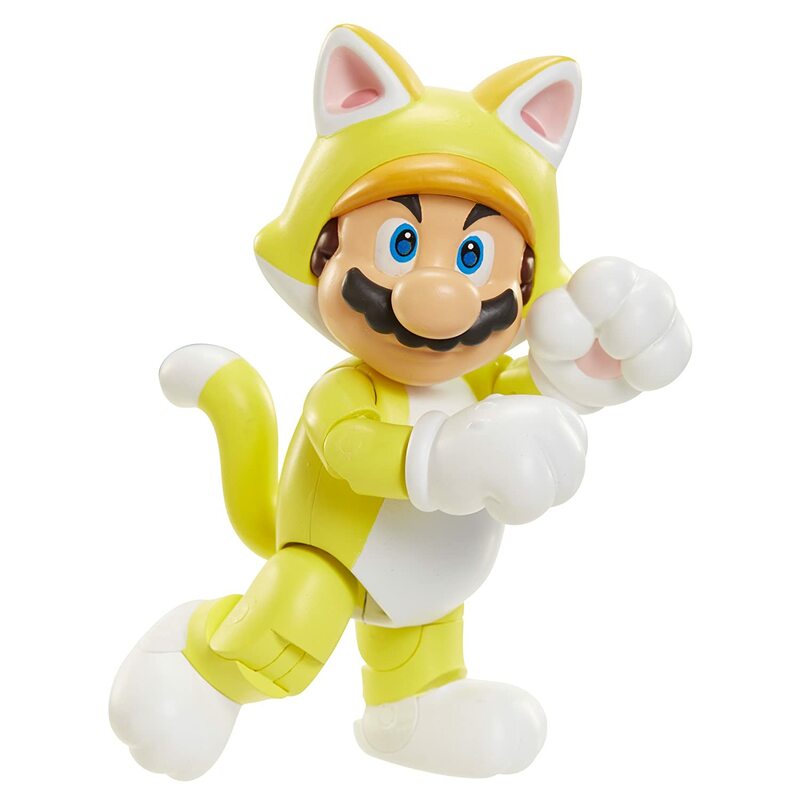 Cat Mario has four fingers instead of five and has little paw marks on his hands. Pretty cute. He also comes with his own power up as the mystery accessory which is a bell. You can move his tail too. In conclusion, Cat Mario is just the sweetest thing. That’s it for the four inch World of Nintendo Marios. Some Mario figures on sale are the two and a half inch Marios. Those include an 8 bit Mario and a silver Mario as well as a few others. But, you can’t move them around like the four inch ones! The smaller ones are much more like statues than action figures. As a result, they are great, just not as great as the four inch ones. 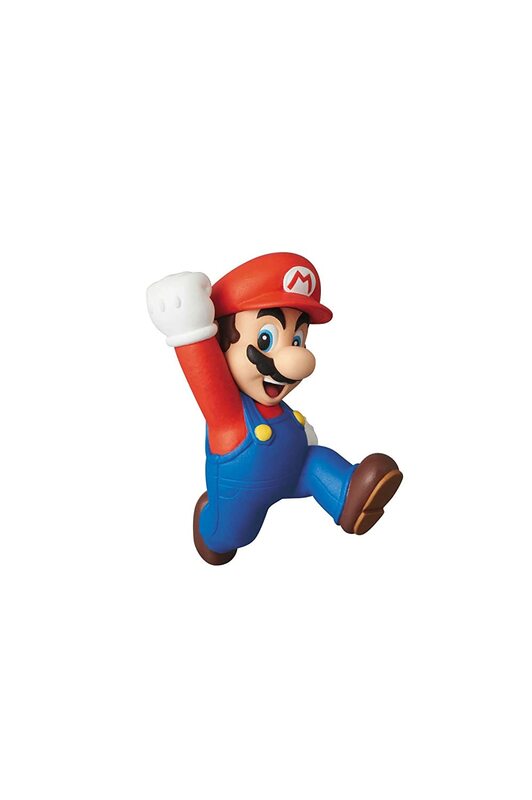 There are four Super Mario toys figures from Medicom that I’d like to highlight. We have the mario from the old arcade game, mario from NES, Tanooki Suit Mario from Super Mario Brothers 3, and the modern classic Mario figure. We’ll start these in order. Mario from the 1983 arcade game. He is a classic adaptation from the old arcade game. He doesn’t really look too much like the Mario we know today does he? In fact, if I looked at this a while ago, I wouldn’t know it was even Mario. His colors are a little different especially with his cap being blue. It has some strange horn like things on it. But, he looks just like the poster above from the Atari game. He comes with a display stand as well and stands at 2.5 inches tall. 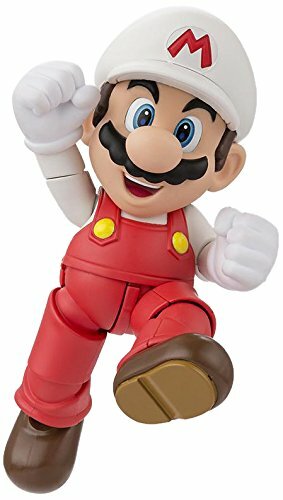 There aren’t too many of these older versions of Mario around so this figure is your best bet if you are looking to collect one. Mario has always had a cartoon like look to him but, this one in particular really exaggerates his features. He definitely looks surprised. I dig this figure a lot. It’s just a totally different take on Mario from what we’re used to. Now we have my favorite Mario from Medicom. 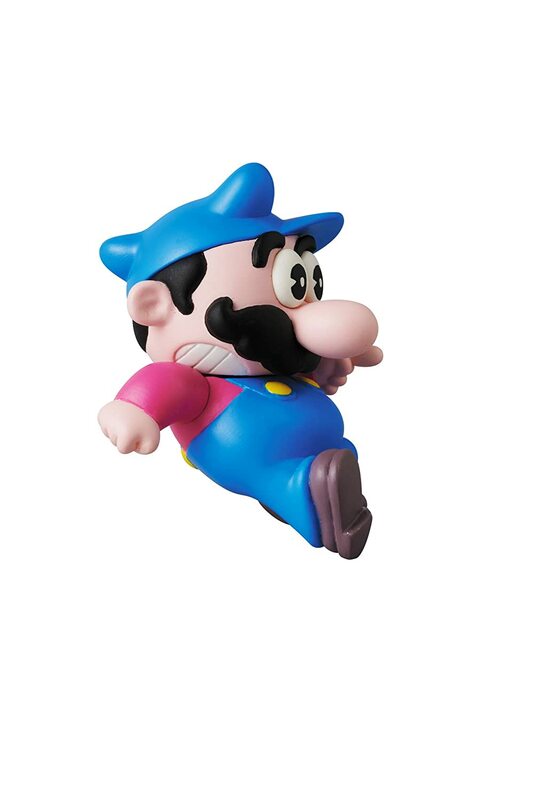 This is another older Mario figure but, this guy is from the NES game. As you can see his colors are inverted so he has red overalls now. The mushroom he’s holding also doesn’t look like what we’re used to. But, he looks spot on for what the NES mario game looked like. Moreover, he looks like the video game promotional materials. This one is also slightly more exaggerated as far as the facial features go. Lots of detail on this guy and he looks great. This figure also comes with a black display stand and he’s 2.5 inches tall. Mario looks like he’s ready for action in a pose that fits him really well. He actually makes me think of a claymation type of Mario. What do you think? Tanooki Suit Mario is from Super Mario Brothers 3. He is also 2.5 inches tall and comes with a black stand. He is a really nice figure. The build of him is just round, short, and cute. Honestly, I don’t think the ears and tail hurt his appeal either. Since they are especially cute. As a result, Medicom did a such a fantastic job on this one. And finally we have our modern Mario that everybody knows and loves. 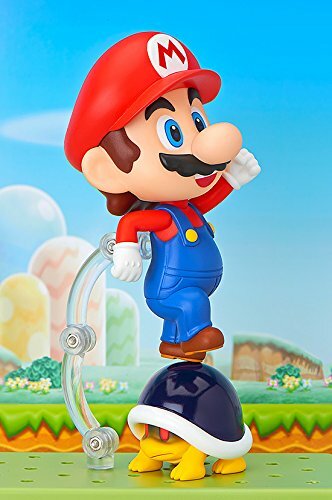 He is in a jumping pose just as Mario should be and he’s in his usual colors of red and blue. Also 2.5 inches and comes with a display stand. 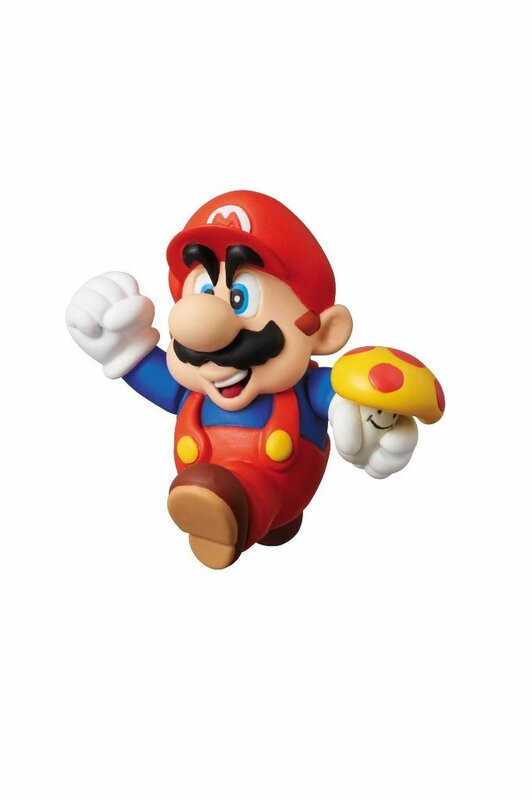 This is the only Mario that seems completely different from the other Medicom figures. He isn’t as rounded and short looking. His build is a lot different. I suppose the other ones are based on more early artwork of Mario. This one is of a modern Mario. Thus, this is a great figure to finish off a collection of the Medicom Marios. Isn’t that a lot!? You can switch out a lot of things for different looks. Such as putting the legs on so he looks like he’s jumping. The figure is made by Good Smile company which also makes many other Nendoroid figures. Nendoroids usually have cute heads and come with many accessories, indeed, just like this Mario does. He is a quality figure and I can’t recommend this one enough. After all, I think for what you get it’s a great price. There are two especially awesome Mario figures from Bandai. One is the classic Mario in blue and red. The other is the fire flower Mario in red and white. They both are very similar except for their accessories. 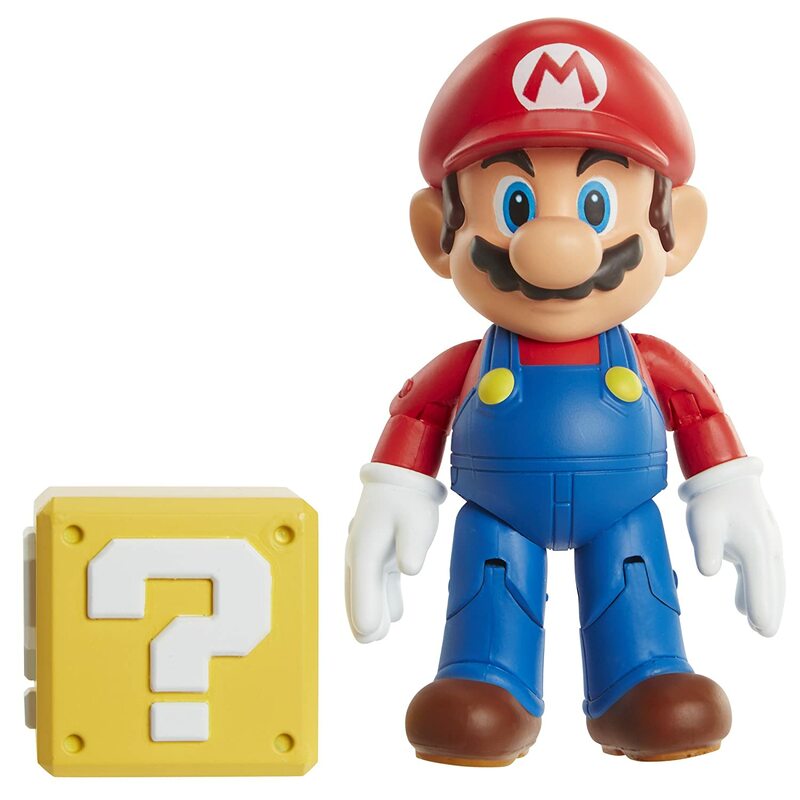 Classic colored Mario comes with a coin, a mushroom, and a question block. 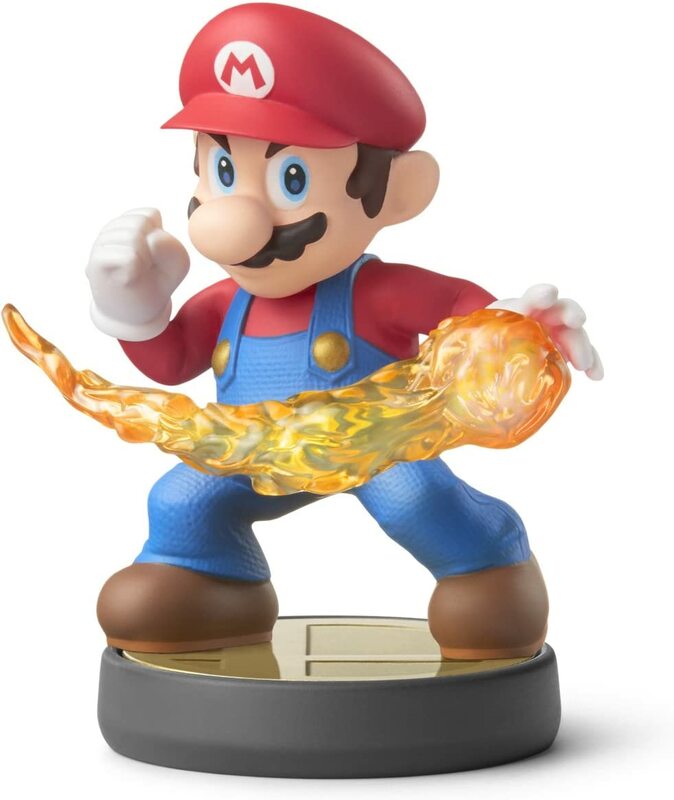 Fire flower Mario comes with two fireballs, a fire flower, and an open hand attachment that you can switch out that makes it look like he’s throwing the fireballs. So, you can create more awesome poses! Similarly, both of these figures are really nice action figures. They have a lot of articulation because of their ball joints. These two Marios are probably the easiest to pose out of all of the Mario figures because of all of the joints. Thus, I think if you’re looking for action figures with a lot of movement and accessories, these are the best choice. They’re probably the closest you can get to a real life Mario. These two guys are from a manufacturer called First 4 Figures. 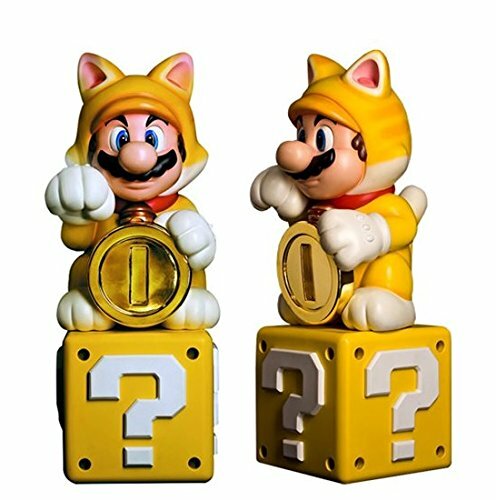 Tanooki and Gold Cat Mario are high-quality limited edition Mario figures and they are 15-inch toys. Quite big indeed. They are made from more expensive materials and are hand painted. The Tanooki Suit Mario stands on a grass block. Similarly, Cat Mario sits on a question block. These can be really hard to find since they are limited edition. I hope you’ve enjoyed my Mario action figure review. These were all of my favorite Mario toys. Want more options for Mario toys? There are some really fantastic plush toys out there. Take a look at these fantastic sets of Mario and Luigi plush toys as well as these fantastic Mario stuffed animals.